IN THE EARLY DECADES of the nineteenth century, evangelical Christians had reason for confidence. A wave of revivals had breathed new life into Protestantism. The rationalistic moralism of the Enlightenment had been swept away by passionate faith in Christ and in the Scriptures as the Word of God. Eighteenth-century challenges to belief had been answered—by making the very kind of appeals to nature and reason the Enlightenment had valued. Popular author William Paley argued for God’s existence based on the design and order found in creation. Paley pointed out that if you found a watch on a beach, you would assume someone made it. Similarly, the complexity and beauty of creation pointed to a creator. Growth in scientific knowledge was seen as one more sign of the progress of divine truth. Even darkness and tragedy were part of the divine plan and would eventually produce a greater good. “Natural theology,” which looked to scientific exploration of nature to explain God’s attributes, flourished in the early 1800s. One significant evangelical natural theologian, Scottish Presbyterian Thomas Chalmers (1780–1847), reminded his compatriots that God was not only benevolent but also a stern judge of human wickedness. Human suffering could be traced back to his judgments. Both Paley and Chalmers were influenced by economist Thomas Malthus, who wrote that human population, given favorable conditions, would quickly outstrip the capacity of the earth to provide food. As a pastor in Glasgow, Chalmers took this dismal prediction as a challenge. He sought to replace government poor relief with a system by which the local parish discriminated between “deserving” and “undeserving” poor. In this optimistic era, many people discussed the relationship between science and the Bible. Theories of evolution were prevalent, particularly the view propounded by Jean-Baptiste Lamarck (1744–1829). But that optimism would soon be challenged. At approximately the same time that Chalmers was thinking about the undeserving poor, Charles Darwin was searching for an explanation of what he had observed on HMS Beagle. Lamarck imagined that evolution naturally moved toward greater perfection—that it had an ultimate purpose. But Darwin thought that the decisive factor in evolutionary change was the better chances of survival certain adaptations provided. He did not have an explanation for how the changes happened in the first place. Nor did he think everything was getting better and better. The most challenging aspect of Darwin’s theory to his contemporaries was that stated absence of any ultimate purpose. The major question for evangelical interpreters of Darwin was whether Darwinism automatically eliminated divine supervision from nature. Was the watchmaker still behind the watch? Almost all Christian opponents of evolution in the nineteenth century, Hodge included, accepted the claim that the earth was very old and that species had appeared gradually. His scriptural objections to evolution were not based on a consistently literal reading of Genesis, even though Hodge was one of the major architects of the modern theory of biblical inerrancy. Hodge believed Scripture taught that God created species separately. But he did not dismiss as unorthodox or ungodly those Christians who differed with him. It was enough if they agreed on the much more important point that nature showed evidence of divine design—that the watch had a watchmaker. And Hodge did not speak for all evangelicals. One he did not speak for was Asa Gray (1810–1888), the most prominent American botanist of his day, a Harvard faculty member, and a committed Christian at a time when most Harvard faculty were Unitarians. Gray became a personal friend of Darwin and one of the few people with whom Darwin shared the details of his emerging theory before his book came out. Gray believed that divine design was quite compatible with evolution and endeavored to convince Darwin of this. He also carried on a long-running argument, defending evolution against the racially segregationist creation account of the famous scientist Louis Agassiz. Agassiz insisted that God had created the races of humanity separately. Transgressing these bounds—especially by intermarriage between races—was a sin. Agassiz was a Unitarian, and his view was hard to reconcile with the biblical account of Adam and Eve. Hodge’s legacy at Princeton Seminary was continued for a time by his son Archibald Alexander Hodge and his successors Benjamin Warfield and J. Gresham Machen. These younger Princeton evangelicals, while staunch defenders of biblical inerrancy, were far more open to Darwin. A. A. Hodge at first defended his father’s anti-Darwinism, but moved to a more accepting position. Benjamin Warfield agreed with Princeton University president James McCosh that Darwin’s theory helped explain how God had designed creation. For McCosh, Darwin was the new and improved Paley: evolution simply showed how the watchmaker had accomplished his astounding feat. Other evangelical intellectuals fell at various points on the spectrum between enthusiastic acceptance of Darwin and complete rejection. There was no one stance. Few if any maintained a “young-earth” position. And even those who opposed evolution, like Hodge, were willing to say that their opponents were still Christians. But, in the early twentieth century, this situation changed rapidly. The multivolume Fundamentals, published between 1909 and 1915 to defend conservative Protestant theology against the rising tide of “modernism,” gave “fundamentalists” the name they have borne ever since. 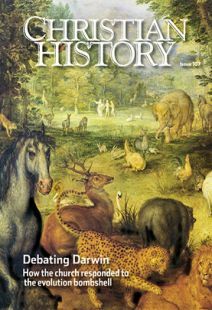 Early volumes contained a range of positions, from an outright defense of evolution by George Frederick Wright, to a more cautious endorsement from James Orr, to two full-on attacks. One, an anonymous essay on “Evolutionism in the Pulpit,” claimed that any Christian who accepted evolution was embracing a “half-truth” and flatly contradicting Scripture. By the 1920s this last voice dominated among conservatives. They were rapidly losing power within major American Protestant denominations, at least in the North. Meanwhile science had increasingly become the domain of “professionals,” with no place for the gifted amateurs who had dominated a century earlier. A rapidly expanding gulf arose between science and conservative Christianity. Many fundamentalists had also adopted dispensationalist theology, which taught that the end of the “church age” was approaching and apostasy with it. Efforts to make society better were pointless at best or deceptions of the Antichrist at worst. Evolutionary theories based on God’s gradual working seemed tainted and unbiblical, at odds with reality. World War I, communist revolution in Russia, and rising secularism in the West seemed ready evidence of impending doom. The most famous anti-evolution spokesman of the 1920s was populist politician William Jennings Bryan. Bryan has been caricatured—including by the media in his own day—as a naïve biblical literalist. In fact, while he worked with early “young-earth creationists” such as George McCready Price, Bryan had no problem with an old earth or with evolution of nonhuman living things. By 1925 liberals in positions of cultural power were confident that history was going in the right direction. The belief in social progress that enabled so many nineteenth-century evangelicals to accept a form of evolution had sparked some of the greatest social reforms in Western history. But by the 1920s, it was clear that progress had its dark side.